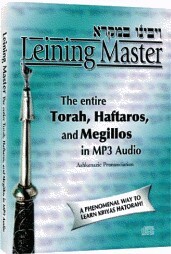 This amazing MP3 CD is the ideal tool to help you learn to chant the Torah, Haftaros and Megillos. Whether you're an upcoming Bar/Bat Mitzvah preparing for your big day or an adult intent on learning or enhancing your Torah reading skills, this CD is for you! Plays on any computer or MP3 CD player. Please Email or Call 0870 360 3699 to enquire about site licenses, network versions, bulk discounts or educational pricing. Processor Yes Plays on your computer or any MP3 CD player. No computer required! Email to check latest pricing or stock availability or for a bulk discount quote of up to 40%. Any questions prior to ordering? - then email: Sales or call us on 0870 360 3699, otherwise proceed to the Order Form.